One of the most delightful parts of life is to own a pet. It is a creature that will help you to improve your personality, living, and never ending source of happiness. In exchange for them to live healthy, you have to give them love, protection and care especially on season like the summer. This season includes the increase in temperature, which can affect your pet’s daily life. 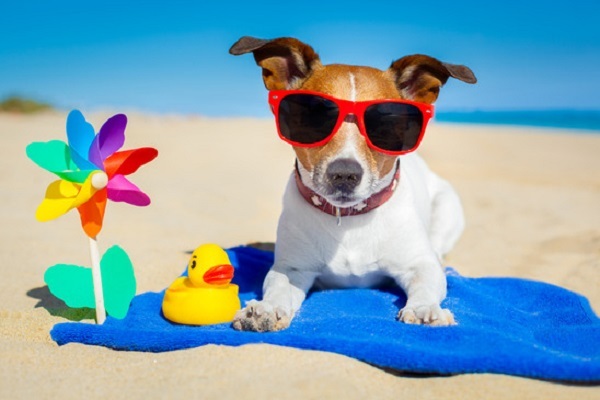 It is essential to keep your pets cool and healthy during summer, this will help them to keep away from sickness and other health problems that cause by heat. It is ideal if you can manage to walk with your dog early in the morning or late at night. These are the best times when the temperature is low and you can roam around in any places without thinking about too much sunlight for your pet. - If you really have to walk with your when the sun is up, make sure to use them with boots that can comfortably fit into your pet. This is a way of protecting them from the heat arising from the ground. Pets like dogs cannot sweat, so an overheated dog will drool excessively along with panting. Provide them with water, as much as possible cool (but not too cold). If you walk with your pet, make it a habit to bring water for your dog in your bag. your pets have higher risk of dehydration and heat stroke if they are overweight. Feed them with foods that have low-fats but at the same time, make sure that they are full for the rest of the day. Avoid leaving your pets on your parked car even if they have their own food, water and air conditioning. Better to let them stay at home, leave them everything that they need for the whole time that you are not around. Find a place around your house that has shade and buy a mini pool where your pets can enjoy. This is the best way to keep them hydrated inside and outside of their body, help them feel fresh and relax after the swimming. - For cats and other pets that normally do not swim and enjoy the water, keep them in a place ideally with a tree to keep them fresh or keep them inside your house. The tips that are shown above are simple, make it ideal to develop more things about taking care of your pet during summer, winter or anytime. Pets don’t only increase responsibility, as a pet owner, it will help you to manage your time, improve your health, and help us learn more about life. Give them the best care that they deserve and you will receive more than anything life can give. Dr. Nabil Anis is a veterinarian. Throughout his childhood years he was fascinated with animals: dogs, cats, fish, exotic birds, snakes, frogs, turtles, porcupines, Guinea pigs, hamsters, rats, mice, and many more! It was during his childhood when he took care of these animals that Dr. Anis decided he wanted to pursue his life-long goal of becoming a veterinarian. He attended Cairo University School of Veterinary Medicine and obtained his Doctorate Degree in Veterinary Medicine. Padonia Veterinary Hospital prides itself not only on treating pets but also on educating owners about the overall health and wellbeing of your beloved pet. We provide you with tips on how to improve your pet’s weight, activity, and overall happiness. So call us and give Padonia Veterinary hospital a try. How to Prepare to Say Goodbye to Your Beloved Pet? Dogs and Cats: Which Animal is Smarter? Ebola Virus and Dogs: Where Do We Stand? We treat your pet with tender, love, and compassion; that makes all the difference. High quality care doesn't need to be costly. Our prices are among the most competitive in the area. Shop around and give us a call. When you are away, your pet is our responsibility. During your absence, we treat your pets the same way you treat them. Empathy is sympathy and being a hospital for over 40 years we feel for your suffering as well as the suffering of your sick pet. When you are looking for a veterinary care clinic you should be able to count on superior care and excellent service. We have assembled an expert team of veterinary professionals to bring you the best possible healthcare for your pet. We have a state of the art veterinary facility. Call us at 410.666.7878 to schedule an appointment and we will find a time that is convenient for you. Copyright © 2014. Padonia Veterinary Hospital. All rights reserved.